CSR Bradford is Australia’s leading supplier of insulation, acoustic control and energy saving products for homes and commercial buildings. With Bradford you can combine home insulation, ventilation and our solar panels to reduce your dependence on utility companies and keep your home at a more comfortable temperature all year round. With almost 40% of your energy bill coming directly from heating and cooling your home, it’s worthwhile to consider how to best insulate your home. Whether building a new home or undertaking alterations or additions to existing homes, insulating walls and ceilings with Bradford Gold, Australia’s leading insulation, is a proven performer and will provide peace of mind for you and your family. With almost 40% of your energy bill coming directly from heating and cooling your home, it’s worthwhile to consider how to best insulate your home. 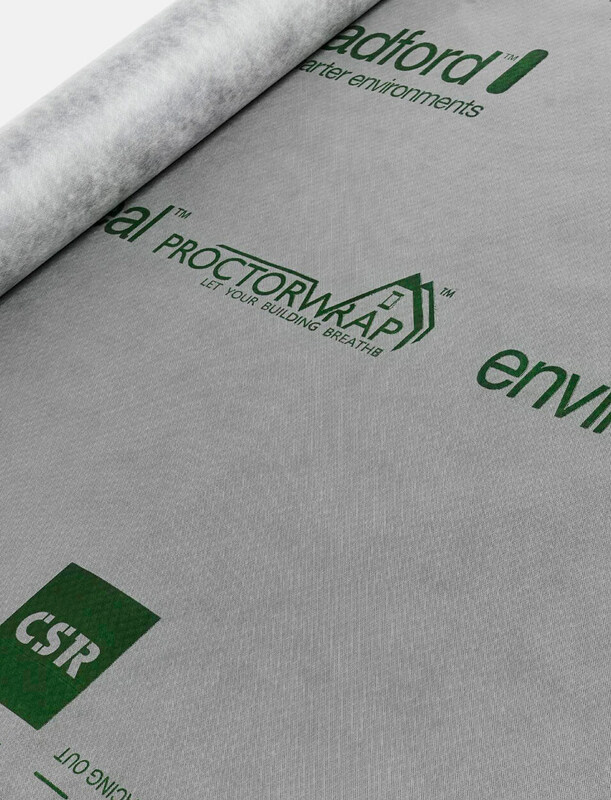 The high water vapour permeability of Enviroseal™ ProctorWrap™ RW allows for the controlled escape of water vapour from within the building whilst restricting the ingress of liquid moisture, helping to protect the building fabric and insulation from condensation and related problems such as mould, timber rot, corrosion and loss of thermal resistance.